So I’ve had this incredible eye sore in my entryway since the very beginning of my house renovation. We can blame me and the epic lack of communication with my electrician remains a VERY sore spot for me because it apparently never occurred to anyone that we needed to discuss the location of the new panels SO they ended up right here, right by my front door. Ugly. Ugly. Ugly. Horrible eye sore that I’ve been planning and scheming to get covered up this entire time. Outside the house it looks just as horrible, a nice electrical conduit welcome greeting for anyone coming in. But, unless I win the lottery some time and want to hire someone to undertake the immense (and extraordinarily costly) task of moving the panels, all I can do is make the best of this ugly situation. 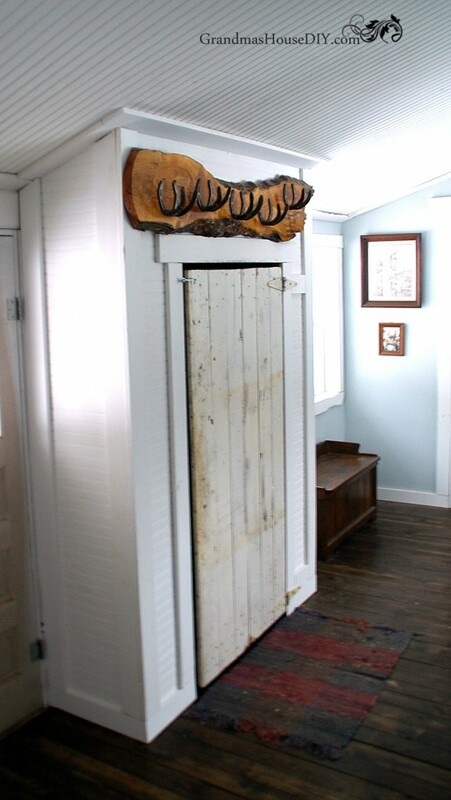 Of course, my plan began with the idea that I wanted to make a barn door closet, as I’ve got several wonderful old barn doors laying around 🙂 So, this is where I started. NOTE: My final walk-through Electrical inspection was AFTER this was built and I passed without incident. On a related note MN’s electrical code is considered one of the harshest in the country and this wasn’t an issue. 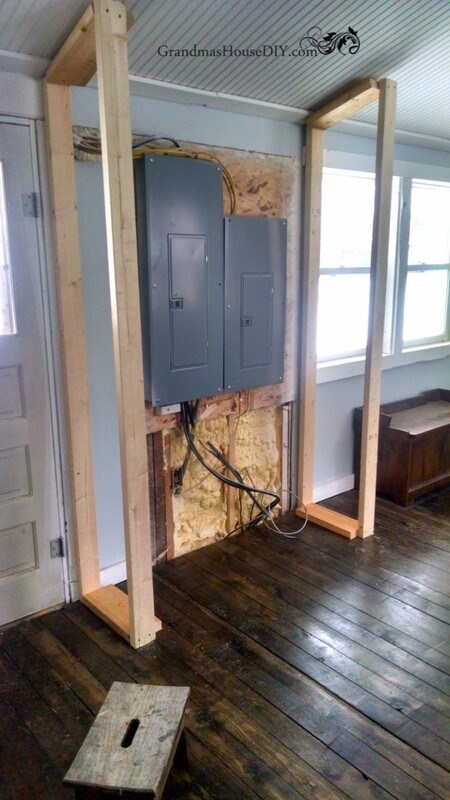 But, before building anything in your own home make sure and check your local state electrical codes. Thanks! I went to my stash of left over 2x4s and 2x6s and managed to build the entire frame out of scrap lumber from the house renovation. 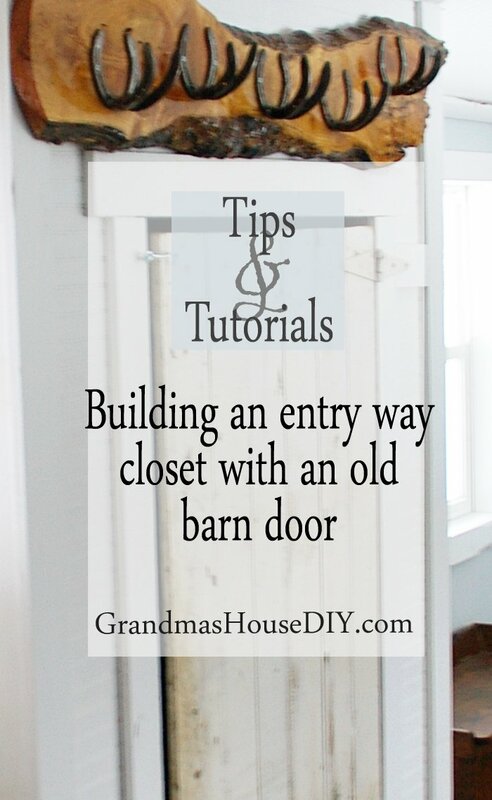 A barn door closet has to first start with a good frame! Really, I just built a little room. It is not the exact right way to frame in a closet, but it is sturdy and level (screwed to the ceiling joists and the floor) so I’m ok with it not being perfect in wall building standards – it certainly isn’t holding up the house or anything. I used a 2×6 on the right side of the door frame to give extra support for my old barn door. Like so many things in the house this old door was actually the old wood shed door and, amazingly, this is the old wood shed that is now my entryway. 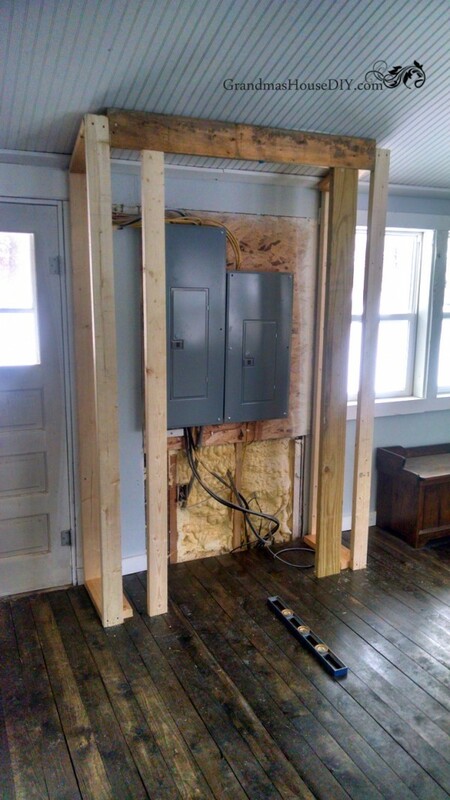 I just took down the wall between it and the house and added a floor as it all shared the same roof line and, suddenly, I had 200 square feet of more living space. I got to work then covering the entire frame with leftover bead board. If you’ve every worked with ply bead before (plywood that looks like bead board) you know you only have two sides with a tongue and groove to work with so, to not have any seems, you need to keep your wits about you. 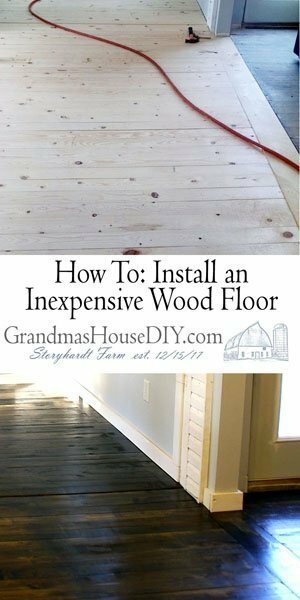 If I had just bought full sheets of new ply bead this would have been a much quicker task, however, I saw no reason not to utilize the scraps I had and, low and behold, it was enough to cover my entire barn door closet! Some one, who shall remain nameless (me), forgot to take pictures after I covered the entire cabinet in trim! Amazingly, I had enough scrap leftover from trimming the house and out in the barn to do all but one piece of all of that trim! So, for a cost of all of $2 I grabbed a 6 foot 1×4 at my local lumber yard after work and completed all of the trim using my air compressor and brad nailer. Then I got to painting! If you’re going to believe me when I say that painting bead board is easy then I have a bridge to sell you 😉 I did two coats and then hung up the barn door and my beautiful coat rack to finally complete our barn door closet! Finally I have a place to hang my coats and leave my shoes after work at the end of the day!! My dining room is to the left there in the picture so, inevitably, every day I would come home and my coat would be hung on a dining room chair and, pretty soon, it looked like my entire closet was hanging out around my dining room table. Not good. 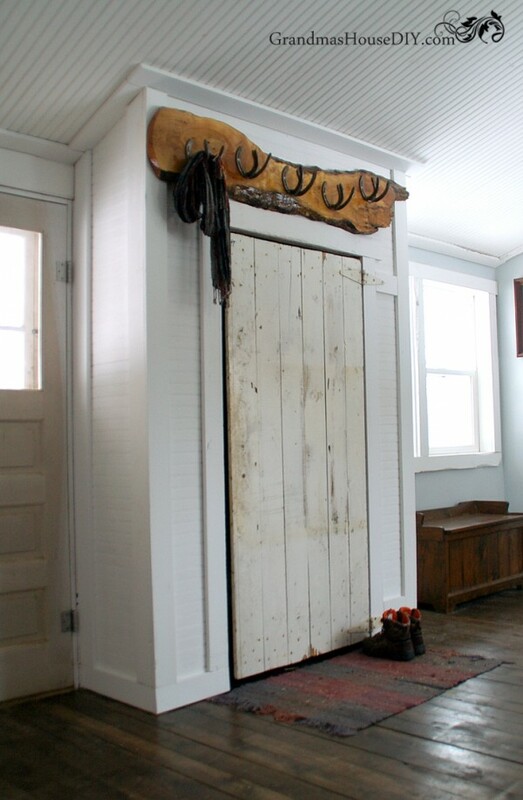 Now, I come home to my barn door closet, have a spot for my shoes, have a place to hang my daily coat and, a place for my guests to hang their coats too! Yay! Your electrician was an idiot to put that right by the door!! Your solution was inspired and perfect! Thank you so much! I’m so relieved to get it done, every day I walked by that it bothered me! I have read this several times, and still I shake my head. The electrician was a fool. You did a fabulous job of hiding the nincompoop’s screw-up. Great job! I love the way you found a solution out of what you had. Visiting from Vintage Charm. you have mad skills! Love this solution. 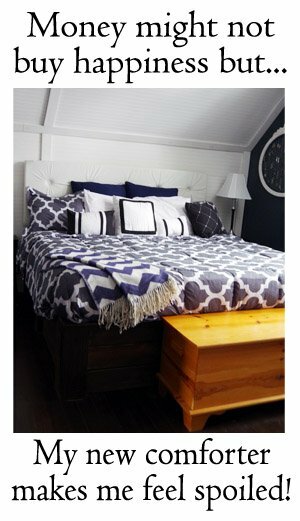 I love anything with a rustic style to it! This turned out so great! Thanks for linking up for Friday Favorites. I’m featuring you this week. Dawn thank you so much and you’re welcome any time for either coffee or wine! What a clever solution! Your a feature this week at Welcome Home Wednesdays! Congrats!! Erin, thank you so much! WOW…love it…all the hard work paid off…looks awesome!!! Great camouflage and bonus storage, but, seriously, what was that electrician thinking? So glad you thought “outside the box”!!!!!! Ann, thank you so much!! This looks great!! I love the barnwood door. Thanks for sharing on Pleasures of the NW’s DIY party! Love this! Found you on Our Simple Homestead Blog Hop! Great solution to an unusual problem. 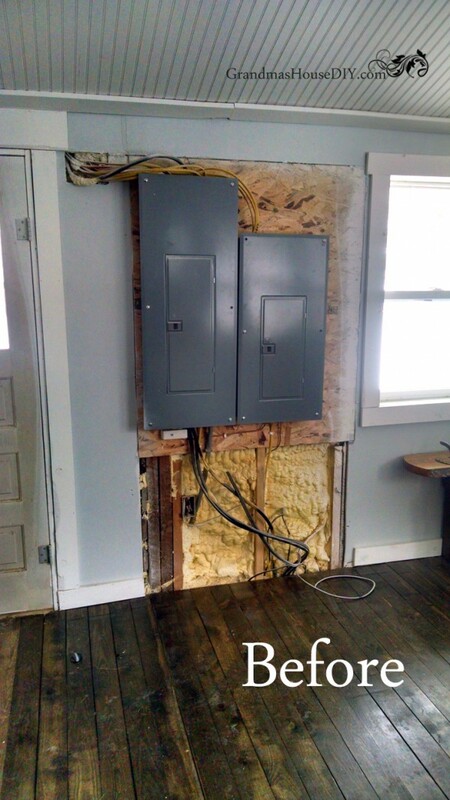 I’ve never seen electrical panels anywhere but in a garage or a back closet. 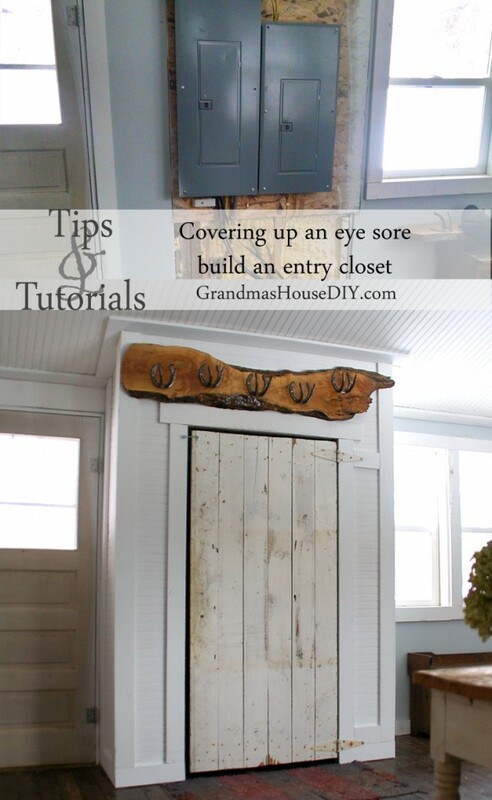 The mix of the old barn door and your coat rack is really nice. Thanks for sharing at Your Inspired Design. Your closet looks fantastic, and I especially like your live-edge antler coat rack above the door. Did you make that yourself, too? Jen, isn’t that coat rack amazing?! No I wish I had made it though, I might have to try making one, it was a wedding gift from some of my cousins! Thanks! What a fantastic way to deal with an eyesore! I am so envious that you have several barn doors “laying around”. I should be so lucky! You really did a fantastic job. I could stand to take some lessons from you! I do have a couple more and I’m trying to figure out what to do with them because they are just so cool 🙂 Thanks for coming by!! What a fantastic solution! Definitely no longer an eyesore! 🙂 Love, love the barn door! Kristine, thank you o much!!! What a fabulous cover up! I still can’t believe the electrician did that. Just absolutely crazy! Lack of communication or not. Do you think he would like that in his home? You sound a lot like me and don’t want to hurt peoples feelings. I would have just accepted it as well, but really it is just unreal that he would think it was satisfactory. Thanks for sharing with SYC. I am all for putting those things in a closet too! That’s where mine is too! Thanks for sharing at Home Sweet Home! Wow! Tarahlynn! I can’t believe that you would even have to say something about location…unbelievable. But it turned out to be a win win for you, because that looks terrific! Thanks for sharing and joining us at the Dishing It & Digging It Link Party. See you next week! Thank you so much Carla, once I finally got the closet done and it all covered up I was able to “get over it” a little bit! I still have my Arabian gelding that my parents purchased for me when I was 11 🙂 He’s 27 now but he’s still such a doll and I don’t ride him anymore, but loving on him every day is so good for my heart. Thanks again! 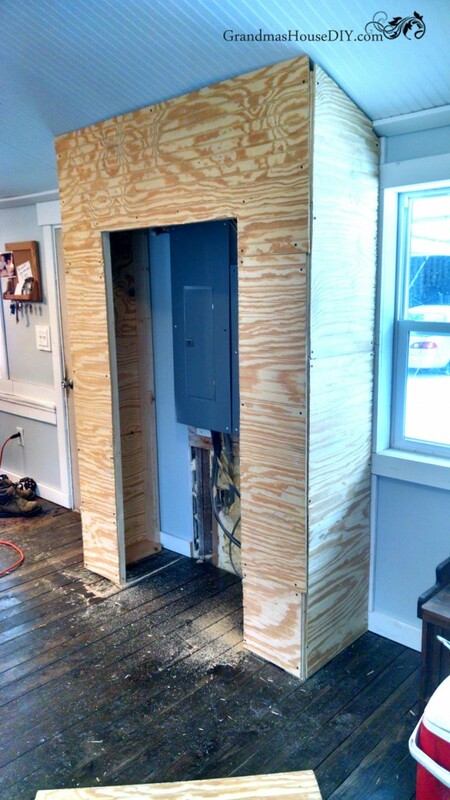 I can’t believe the electrician put the panel right by the front door! And I’m so impressed that you were able to make that closet almost entirely with scraps. It looks gorgeous. Thanks so much for joining us at the #happynowlinkup this week! Thank you so much, with that darned panel out of sight now I’ve been able to move on from the angry lol! Great idea and who couldn’t use more storage!! Thanks for bringing your post to Throwback Thursday This week! I cannot believe your electrician did that to you! Great fix! How amazing are you!! That is an awesome and now practical solution to your problem. Hi. Nice job but wondering what the building code is in your state? Panels are now exposed for emergency crews to locate to shut down in case of an electrical fire. Hi Char, our final walk-through Electrical inspection was AFTER this was built and we passed without incident. On a related note MN’s electrical code is considered one of the harshest in the country and this wasn’t an issue. Thanks! I agree completely with everyone else. That electrician is an idiot!!!!! Why did he not discuss the location of the box before he put it in. Most put them in the basement or in the back of a closet if no basement. I think maybe I would call and make him foot some of the bill to hide it. Not sure about the building codes where you live, but where I live you cannot have electrical panels inside a closet like this. It’s something worth checking into the codes where you live. Hi Dawn, our final walk-through Electrical inspection was AFTER this was built and we passed without incident. On a related note MN’s electrical code is considered one of the harshest in the country and this wasn’t an issue. Thanks! That turned out so nice! 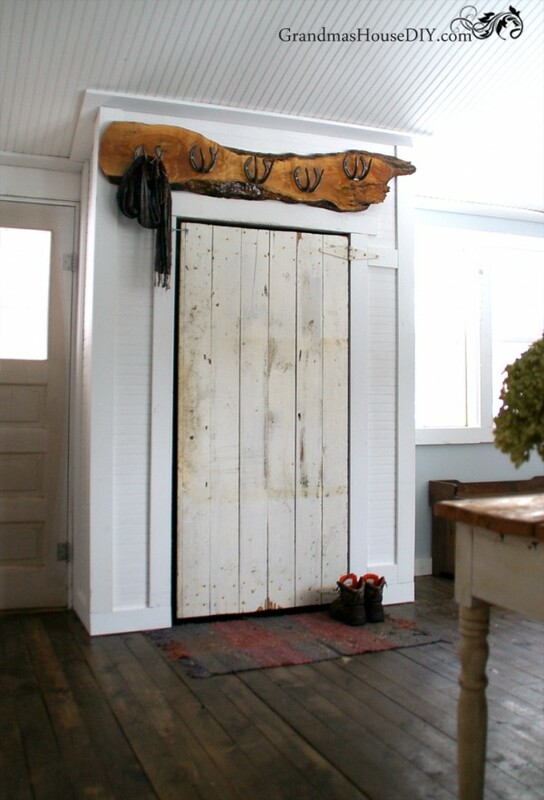 Love the bead board and barn door. Thank you Stephanie! Did you get my email? This turned out so great! You are so handy! I love how an eye sore can turn into something useful and sweet. I had a somewhat similar situation in our basement. 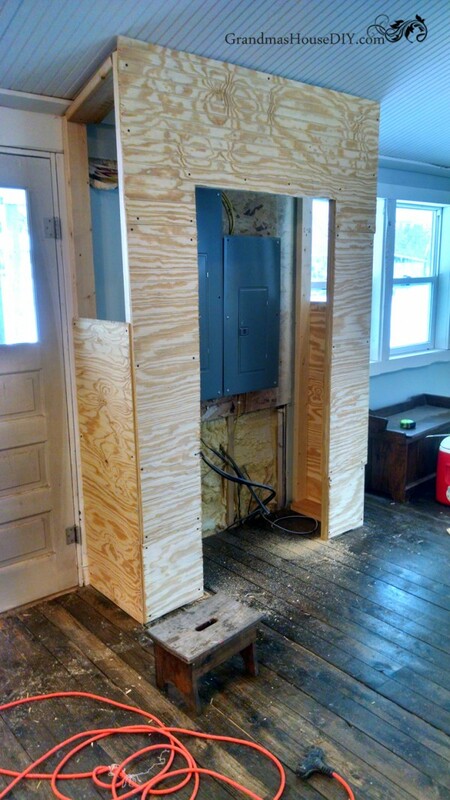 The electrical box is where it should be downstairs, bu when we finished the basement I did not want those ugly things showing. Unfortunately I have a very hard time building things (and I keep practicing), so it took me several weekends of begging to get a closet made to cover it. Congratulations on your carpentry skills, be proud lady. Thanks Leanna I was relieved it turned out, I’m not much of a wood worker so I always just kinda go for it and hope for the best! That looks incredible now TarahLynn and I love the hooks over the door too – great job !! This is so cute. And a great way to cover an eye sore. 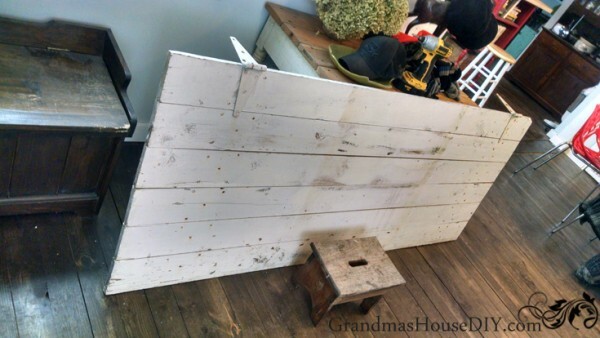 Love that you got to use the old barn door of your grandma. That turned out awesome! I wish I was as handy as you with construction projects. What a huge difference that made! Great way to disguise those panels. Thank you for sharing at Ravenwould. 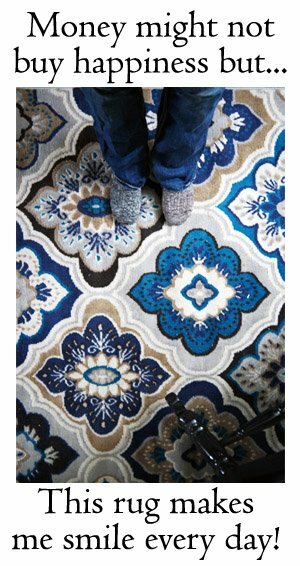 I love how you have transformed something ugly into a beautiful, useful space, Tarah! Thank you so much for sharing, and for being a part of Hearth and Soul! Thank you for coming by April, hope you have a good week! What a transformation! well done. you did a wonderful job there, and besides, the closet is always useful to store things. Thank you for joining The Really Crafty Link Party this week. Pinned!